1 - I shut Jon Dee's fingers in the door of the van one night after a show while on tour and his fingers swelled up so big I did not see how he could play. Somehow he played the next few nights and I apologized to him so many times he still thinks I am a cheese ball. 2 -Yes the rumours are true. When Jim Dickinson came to Austin to produce the band, he had not ever seen them play and preproduction was really some short conversations on the way to the studios in the band or the car. Mainly they were with me and 1 or 2 band members. There was never any meetings or demos made. Another rumor thatis true along this same line that the drummer Whitey...who played drums on the 2nd legendary unreleased Glixman produced session...had never met the band until he came to the studio in Atlanta. Glixman and I picked him up from the airport and on the way to the studio Glixman said "Whitey, just play a snare fill at the end of every section and fill it up with heavy toms every time there is not bass or guitar fill. Whitey did this and really made it a rocking recording...I do not believe anyone ever saw Whitey again, at least not while I was involved with them for the next 4 years. 3 -A quote that came from Jim Dickinson during this first recording was "Never Stop the Tape". This came from a moment where I took the tape machine out of record while Jim was playing piano with the band while we were at Riverside Studio. Javier had tripped over his guitar cable and sarted laughing about it. Denny, the bass player quit playing when Javier did this and the head phone system was so bad that they could not here me try to stop them. 4 minutes later when as the last chord died down and Dickinson said, "wow thats a take" and I had to tell him I had stopped the tape....he was so mad and yelled at me in his Mississippi way,"MIKE...NEVER STOP THE TAPE" I was destroyed....but Jim and I still became friends....and to this day I get "MIKE, never stop the tape" comments from Jon Dee when we are in the studio together! At the allmusic.com site there is an extensive history of the True Believers in their biography section. 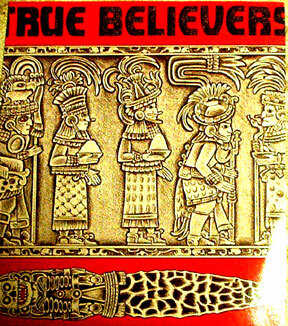 Go to www.allmusic.com and type TRUE BELIEVERS in the search field to find it. We made a really great demo of 8 songs that had "The Rain Won't Help You When it's Over" and Rebel Kind" on it. A lot of labels started snooping around. Joe Nick Patoski was managing them...he also managed Joe King Carrasco, who was one of the first MTV bands with heavy play on the new TV music format channel. Joe Nick was able to get some money from a London label called ZIPPO and Jim Dickinson came in to produce. I ended up producing several cuts because Jim liked the 8 track recordings we made a lot and he and I worked well together so it just kind of was a natural thing, Rounder picked the CD before it was ever even done and then Capiol/EMI picked it up from Rounder before it came out. So voila we had a major label release of a record that was done for less than $8,000. At the same time period, Los Lobos asked them to go on tour with them and Joe Nick asked me if I would help manage and so I went on the road with them. Steve Berlin, producer and Saxophonist in Los Lobos, was interested in working with them and we made a great 4 song demo at Capitol Studio in LA, that has never been released anywhere. The band ended up doing around 150 shows with Los Lobos in the next 18 months and things sort of started reelly getting big around them. The Believers were drawing over 1000 paid people in NYC, San Francisco, Dallas, Chicago, Atlanta...it was good times. The first release sold about 50,000 and things were hot so release number 2 was scheduled. The band wanted a big rock producer and Jeff Glixman (Georgia Satellites, Cinderella) got the call. We recorded in Atlanta and it rocked. But before the 2nd CD came out EMI merged with Mahattan and to form a more Urban presence dropped all of the rootsy bands from their roster. Glixman and the band felt that they did not want the record to revert to the Rounder release deal and became stubborn choosy about who should release it....Rounder, who had them signed to an artist deal, said fine buy us out and go somehwere else. At the same time the big headed dreams of the band and Glixman's star struck advice, suggested to the band they needed big more powerfull managers, so they fired Joe Nick and me. However the business weirdness, the respect of labels for Joe Nick and the wierd vibe in the air around the band with all of this changing of the guard in the middle of the upward trend, sort of left labels feeling the band was trouble and the CD never came out, until years later when Rhino licensed it from Capitol and packaged it as a double CD with the first release. This release is called "HARD ROAD"
I was sad this did not happen. I worked hard to keep things together and help the band stay on a good path, but alot fo bad decisions were made by them before the end that doomed them to run into brick walls over and over after they fired Joe Nick and myself. I learned many things about "the Big Time" in this experience and thank god that Jon Dee and Javier have remained good friends all these years.